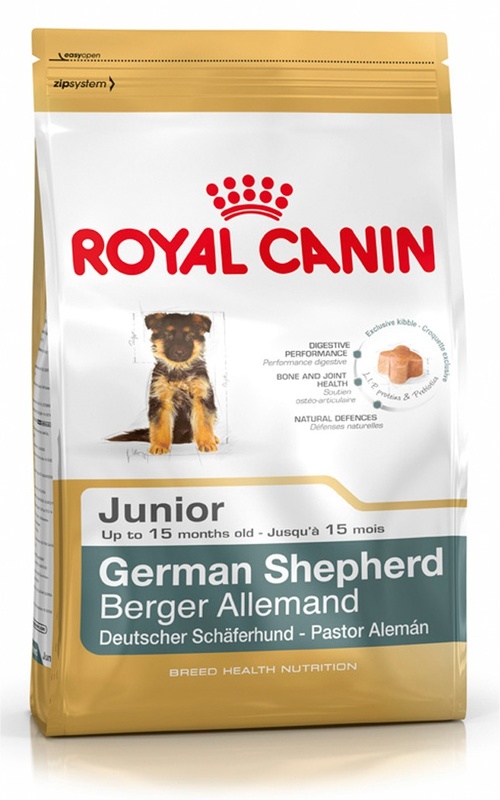 German Shepherd Junior is for puppies from 2 to 15 months. 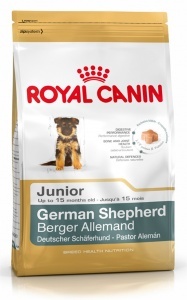 Royal Canin dog food promotes joint health and consolidation of the bone structure with a balanced daily calcium and phosphorous content, with very high levels of chondroitin and glucosamine. Contains vitamin E and C and amino acids ensuring skin integrity, with borage oil and zinc that nourish the skin. Acti-digest in Royal Canin dog food limits fermentation activity in the colon and improves the consistency of stools, thus ensuring digestive safety. rice; dehydrated poultry protein; vegetable protein isolate*;animal fats; hydrolysed animal proteins; vegetable fibres; beet pulp; minerals; fish oil; soya oil; fructo-oligo-saccharides; psyllium husks and seeds; hydrolysed yeast (source of manno-oligo-saccharides); hydrolysed crustaceans (source of glucosamine); marigold extract (source of lutein); hydrolysed cartilage (source of chondroitin). Protein: 30%; Fat content: 16%; Crude ash: 6.6%; Crude fibres: 2.8%; Per kg: Calcium: 11 g; Phosphorus: 8.5 g; Fructo-oligo-saccharides: 3.4 g; Manno-oligosaccharides: 0.5 g.